Toronto is Canada’s largest city. 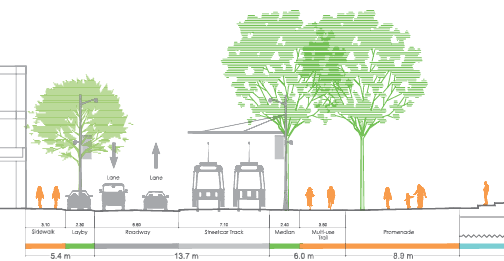 A Complete Streets policy was included in Toronto’s 2014 Official Plan amendment and Toronto’s Complete Street Guidelines were released in 2017. 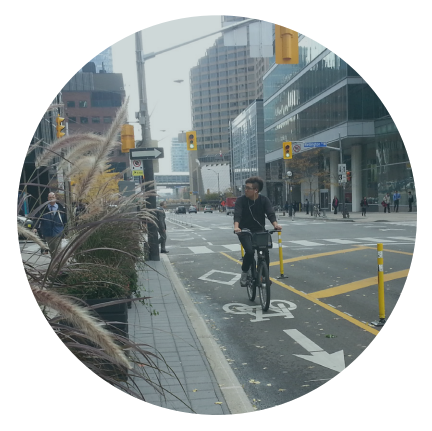 Blog posts about Complete Streets in Toronto covered the release of the guidelines, display panels at City Hall, the redesign of Queens Quay, and the scoping of the guidelines. In January 2017, the Toronto Complete Street Guidelines were published. On February 28, 2017, Transportation Services staff presented the recently completed Complete Street Guidelines to the Toronto Public Works and Infrastructure Committee. While staff recommended that the report be received for information, the committee referred the guidelines back to staff requesting further information on several issues, including establishing more street types, developing map overlays of the different street types, and providing guidance on a prioritization process and decision-making framework. 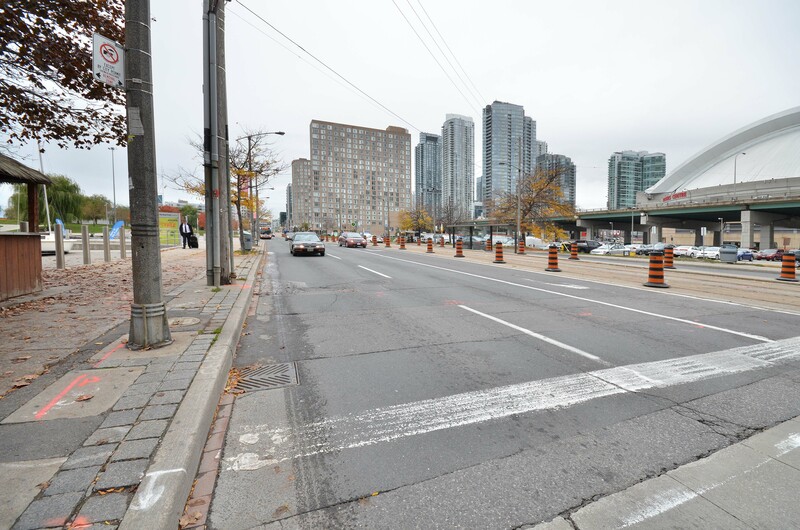 The revitalized Queens Quay, situated on Toronto’s central waterfront, is one of the nine Complete Streets projects profiled in TCAT’s Complete Streets Transformations. 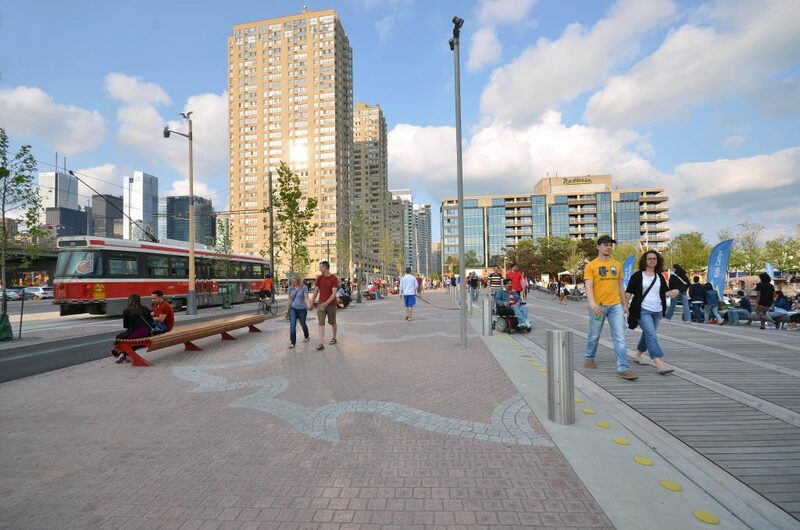 The revitalized Queens Quay along Toronto’s central waterfront has been transformed from a wide roadway to a boulevard that prioritizes walking, cycling, transit, and public space. The street, located just south of the downtown core, is one of Toronto’s most important tourist destinations, home to a great deal of parkland, the Harbourfront Centre, and the Jack Layton Ferry Terminal, which provides access to the Toronto Islands. The project cost $128.9 million and took 12 years to complete (2003-2015), from the adoption of the Central Waterfront Secondary Pan by City Council, to the end of construction. A pilot project that saw one lane of traffic converted to a bike lane on each of them has met with success, and it was one of nine Complete Streets projects profiled in TCAT’s Complete Streets Transformations. 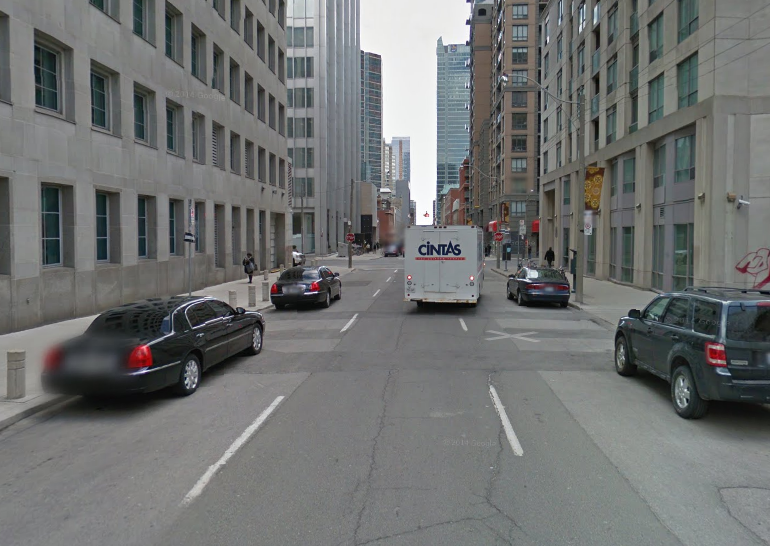 Richmond and Adelaide are a pair of parallel one-way streets that cut through the heart of Toronto’s downtown financial district. 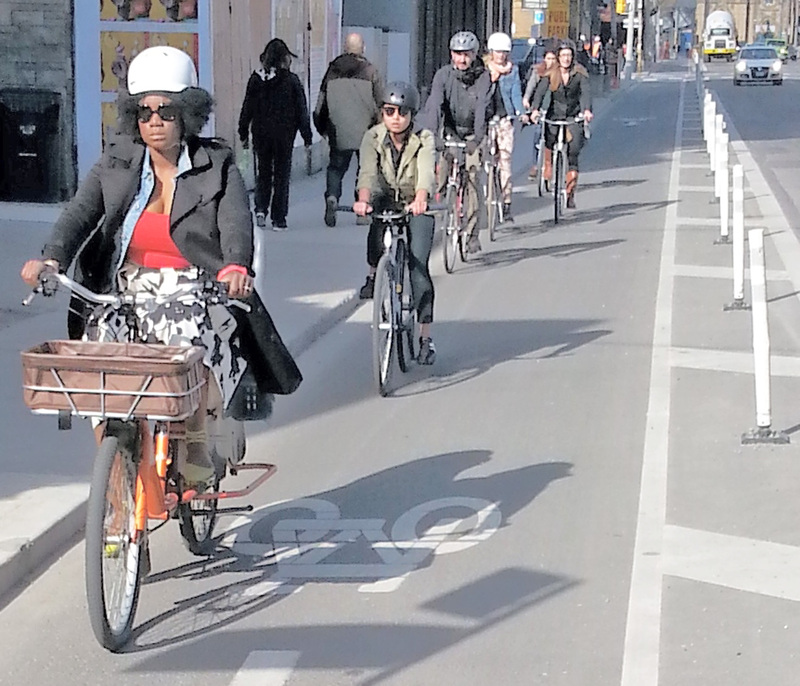 The addition of cycle tracks along this major corridor streets provides a key east-west bike route through the heart of Toronto’s downtown core. Since 2011, the streets have been part of a Municipal Class Environmental Assessment, and the cycle tracks were installed in two phases as a pilot project for demonstration, testing and evaluation. The cycle tracks became permanent in 2019. Reduction of traffic lanes on most sections of the streets from four to three, and at times to two to accommodate off-peak parking or construction staging areas. Travel times for motor vehicles decreased by as much as 30% along Richmond and Adelaide after the first phase of the pilot project. The only increase in travel time for drivers was by 35 seconds (or 12%) on Adelaide during the afternoon peak period. Simcoe Street in Downtown Toronto is an example of how Complete Streets approaches can be integrated into a complex, mature urban context. This pilot project provided a key north-south connection, as it linked with recent east-west cycling investments along Richmond St. W and Adelaide St. W. Currently running between Queen St. West to the north and Front St. to the south (with further phases to come), Simcoe St. works toward improved active transportation network connections and a more inclusive balance of route options for pedestrians and cyclists. Simcoe is notable because it is the first project in the Downtown to use a vehicle parking lane as a buffer for a contra-flow bike lane. In order to accommodate for this new facility, a road diet approach was taken, as 3 traffic lanes were converted to 2, including an off-peak parking lane. The public realm has seen offshoot benefits, as pedestrians are increasingly choosing Simcoe as a route since the street improvements. 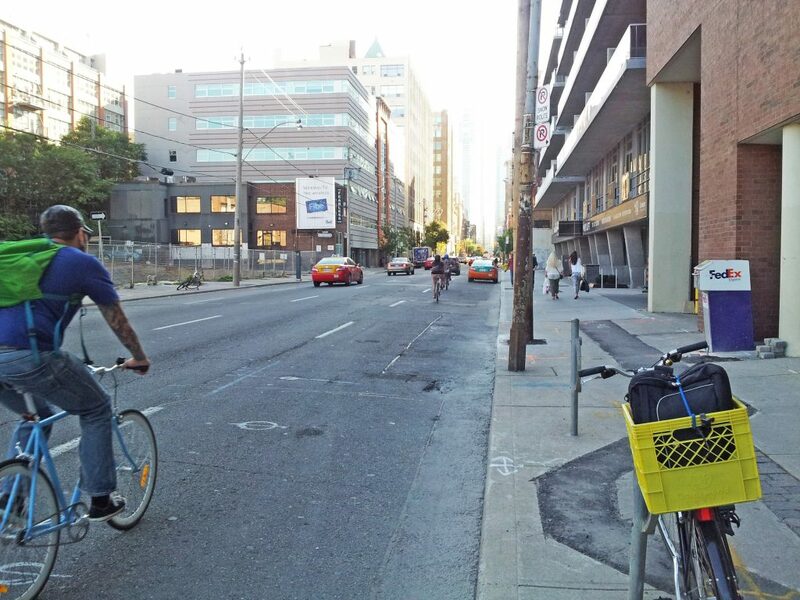 Simcoe Street was featured as a case study in Complete Streets Catalogue, a report compiled by The Centre for Active Transportation. At a cost of $6 million, four lanes on St. George Street were reduced to two, sidewalks were widened and architectural features were added. Automobile speed was reduced and collisions have decreased even though the number of cars carried on the road did not. The City of Toronto took a multi-disciplinary approach to this project. University of Toronto administration and several city departments were involved, including transportation, planning, urban design, forestry, and public works. 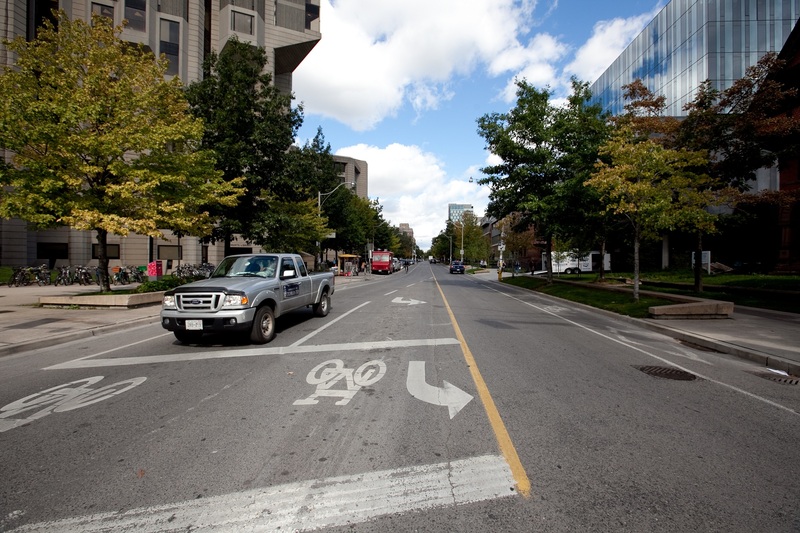 The goals of the St. George Street revitalization and road diet were to calm traffic on this street that flowed through a campus of the University of Toronto; increase pedestrian and cycling amenities and; in general, to create a more human-oriented urban realm. Additional funds from a private donation made this project possible. The revitalization of St. George Street in Toronto was included as an example in Transport Canada’s Complete Streets: Making Canada’s Roads Safer For All (2009). “City streets are significant public open spaces which connect people and places and support the development of sustainable, economically vibrant and complete communities. New and existing City streets will incorporate a Complete Streets approach and be designed to perform their diverse roles by: a) balancing the needs and priorities of the various users and uses within the right-of-way, including provision for: i) the safe and efficient movement of pedestrians of all ages and abilities, cyclists, transit vehicles and users, goods and services vehicles, emergency vehicles, and motorists across the network; ii) space for other street elements, such as utilities and services, trees and landscaping, green infrastructure, snow and stormwater management, wayfinding, boulevard cafes, marketing and vending, and street furniture; and iii) ensuring the safety of vulnerable groups such as women, children, seniors and people with disabilities by implementing the Toronto Safer City Guidelines, or an updated version thereof; b) improving the quality and convenience of active transportation options within all communities by giving full consideration to the needs of pedestrians, cyclists and public transit users; c) reflecting differences in local context and character; d) providing building access and address, as well as amenities such as view corridors, sky view and sunlight; and e) serving as community destinations and public gathering places,” (3.1.1.5). The revitalization of St. George Street in Toronto was included as an example in the Government of Canada’s Complete Streets: Making Canada’s Roads Safer For All.